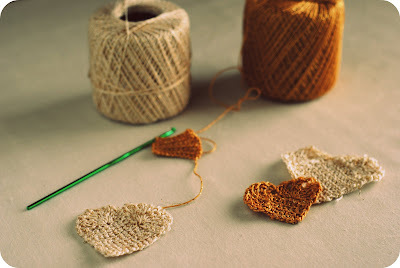 I've been trying to brush up on my crochet skills and this weekend I made some hearts on a string for a little bit of Valentine's Day decor. 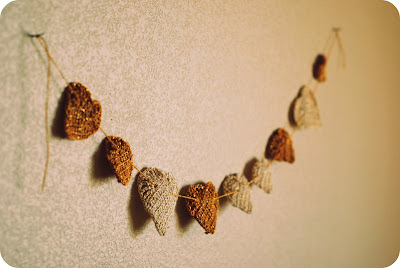 I decided to go with natural and gold thread instead of pink or red so I could leave it hanging up all year long. In order to keep the hearts flat I sprayed them with hairspray on both sides. Husband proposed to me on V-day three years ago so we always celebrate with a mini-reenactment of that night by going to the same sushi restaurant and making chocolate covered strawberries at home for dessert. Maybe this year we will dance under the stars again too. 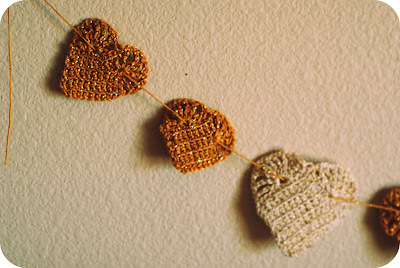 our ward theme is "having their hearts knit together in love and unity" and I always think it would be nice to present our Bishop with a couple of knit hearts in a frame or something. But... I don't knit. Or even crochet. :) It is the thought that counts! I hope to be having a child. Ha! And I love those hearts...so sweet. I randomly found your blog and this post especially caught my eye. This is exactly what I'm wanting to make right now. I'm not super experienced with crochet which is why I wondered if you could provide any pointers? Size yarn, did you buy the yarn at Micheal's?, size hook (looks like 3.75mm), tips on pattern? The hearts look simple enough for me to figure out but any tips will go a long way! Thanks! Oh, I'm commenting again to check the "email follow up comments" box, in case you respond here.